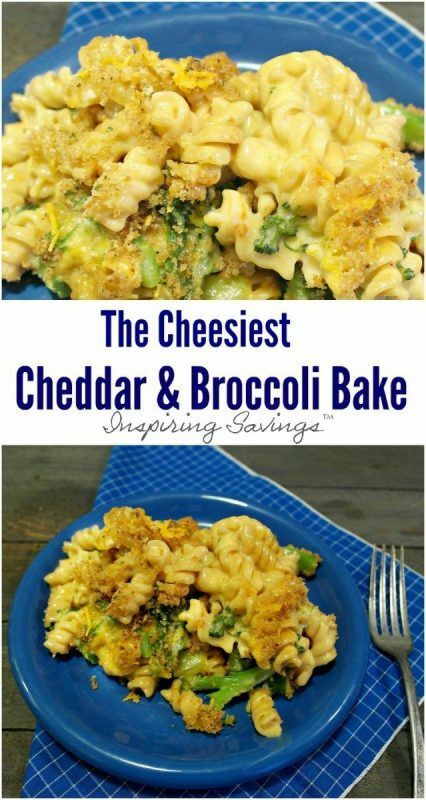 This Cheesy Cheddar Broccoli Bake is a great easy weeknight meal or side dish. Perfect for a family dinner or get together. No cream soups needed for this simple take on a classic recipe! You can use frozen broccoli florets instead of roasting fresh broccoli to make it even faster. This Broccoli Bake makes a delicious side dish or a meal in itself. I enjoy a classic meal like this, and for our family, this meal is not only delicious but it has become a comfort food staple. This awesome homemade version of a Cheesy Cheddar Broccoli Bake contains NO “cream of” soups just wholesome milk. I’ve been craving Broccoli Cheddar Casserole for quite some time, and I finally got around to making it. We’re exploring comforting foods for cooler weather. Want to add a little protein? Just toss in some cooked chicken, bacon, or even deli ham to make this broccoli bake a meal. I like it just the way it is. Creamy, delicious, and filling! I love broccoli and how easy it is to get the kids to eat this dish. I have even had moments when I felt like adding some garlic for a little something extra. 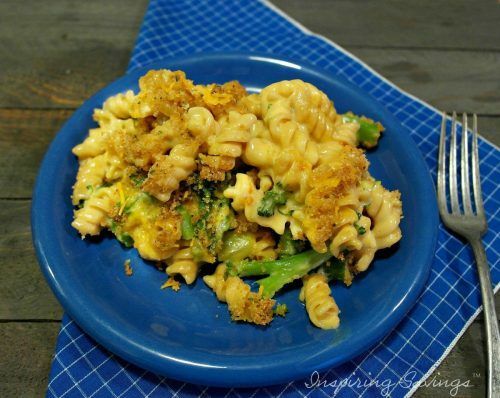 Classic Velveeta cheese and milk are the base for our sauce in this broccoli bake. Melting down in a stockpot takes a few minutes, but make sure to stir so the cheese doesn’t burn to the bottom of the pan. Layer your pasta, broccoli, and then cheese in your favorite casserole dish. 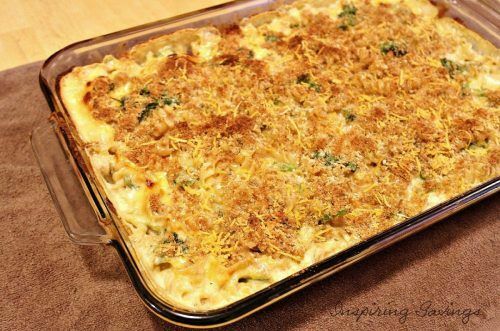 Top with bread crumbs or crushed crackers for a crispy top. 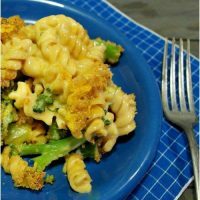 I like using seasoned bread crumbs to add a bit of extra flavor to the dish, but you can use or make whatever you have on hand work in this broccoli bake. We always have a problem of trying to dig right in but letting the casserole sit for a few minutes after baking helps it set to the perfect consistency. The cheese and sauce will thicken up nicely, and it cools off enough that nobody burns their mouth when they take that first bite. This cheesy broccoli bake is a great choice for a fast meal that everyone loves. If you don’t care for broccoli, you can use any other vegetable like green beans, peas, or even carrots and cauliflower for a nice touch. Serve as a side dish, or as a complete meal. Adding a bit of grilled chicken on the side makes it a hearty dish that your meat and potatoes lovers will want, but most of the time I can get away with serving this dish by itself. 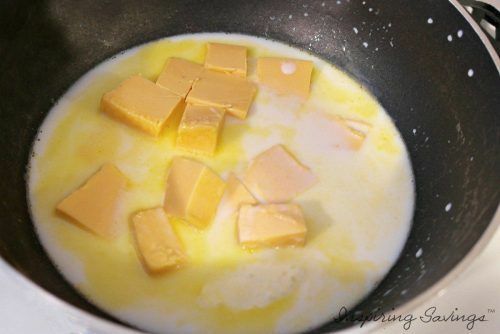 In a saucepan over medium heat, add the milk and Velveeta cheese. Stir often until melted. 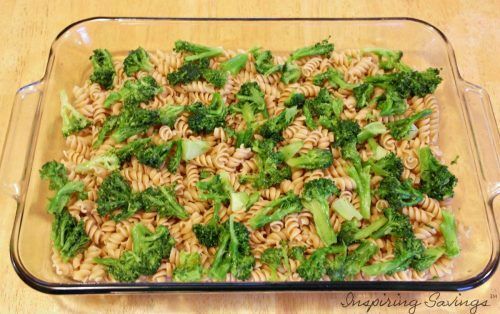 Spoon the cooked pasta into a 13x9 pan, top with broccoli florets. Season with a pinch of salt & pepper. Pour the cheese sauce over the pasta and broccoli. Mix the melted butter into the bread crumbs and sprinkle evenly all over the top. Bake for 30- 40 minutes or until golden brown and bubbling. 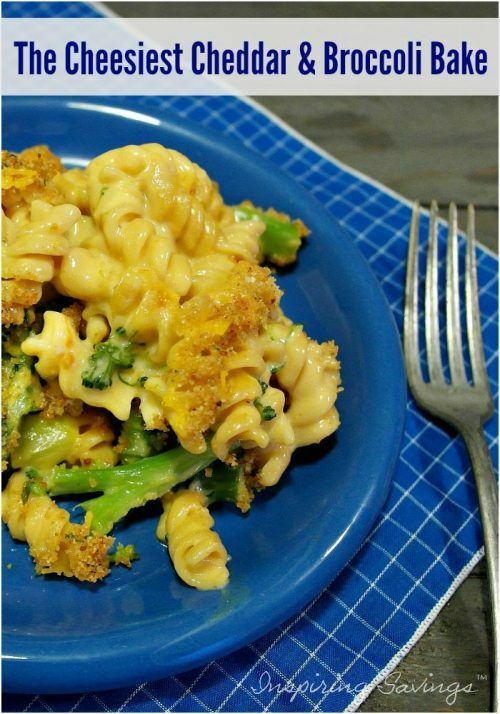 Make our cheesy cheddar broccoli bake with whole wheat or even gluten-free pasta for a fun and yummy weeknight meal your whole family will love! I know I am one who is always ready for an easy meal.